Kaminieli Rakau, 62, is leading more than 30 men cleaning heavy debris and rebuilding homes at Tawava Village in Kadavu which was severely af­fected by Tropical Cyclone Keni last week. “Rebuilding your homes after it has been destroyed by a cyclone is common sense. You don’t need to wait around for Govern­ment to do that for you,” he said. “After our village was hit by the cyclone we met the next day to discuss ways to help us recover. At first we started with the re­pairing of our homes then we moved on to fixing the village school. “For the last few days we have been working day and night trying to fix other houses that needed to be fixed, especially those that were completely destroyed,” Mr Rakau said. 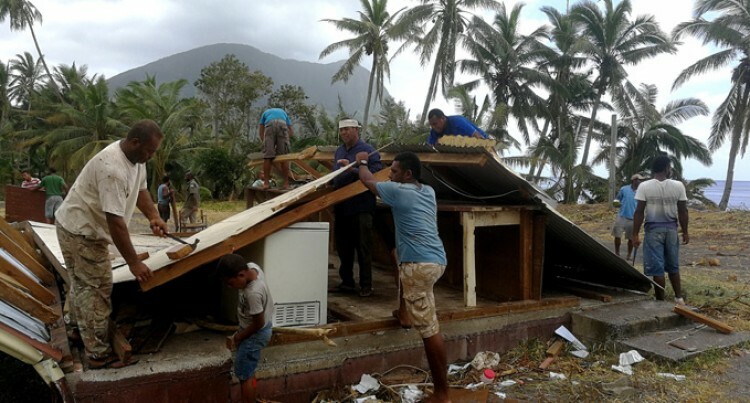 When the Fiji Sun arrived in the village yesterday men were busy clearing out de­bris and repairing house structures de­stroyed by the category three cyclone. Meanwhile, Government officials and military engineers were in the village to carry out assessment on the severity of the damage. He added that villagers have been resil­ient and worked together to make sure all homes were repaired and heavy debris left by the cyclone was removed. The village has more than 40 houses in which two were completely destroyed while five were partially damaged. “Sometimes we have that mentality that Government will do everything for us after we have experienced a natural disaster,” he said. “For us here in Tawava we have gathered all resources and manpower to help re­build our village. Arieta VakasukawaqaFIJI NEWSKaminieli RakauTawava VillageTropical Cyclone Keni.